Barbro Margareta Svensson (9 March 1938 – 3 April 2018), better known as Lill-Babs, was a Swedish singer, actress and television presenter. From the early 1950s until her death in 2018, she was one of Sweden's best known and popular singers. She represented Sweden in the 1961 Eurovision Song Contest in Cannes with the song "April, april". She was also well-known for the song "Är du kär i mej ännu Klas-Göran?" ("Are You Still In Love With Me, Klas-Göran?"). Lill-Babs was born Barbro Svensson in Järvsö, 290 km (180 mi) north of Stockholm. She lived with her parents, Ragnar and Britta Svensson, for nine years in a small cottage without running water. She first sang in a church at age 11. Her first public appearance was with a colleague of her father accompanying her on the accordion. Svensson's first public performance was at Barnens dag in Järvsö 1953. Soon after, she started singing with Lasse Schönning's orchestra. She was "discovered" when she sang on the radio program Morgonkvisten ("Early Morning") in 1954. Simon Brehm, a musician and record producer, liked her and took her to Stockholm where she made her professional singing debut at the Bal Palais restaurant. Brehm was Svensson's manager until his death in 1967. He gave Svensson her stage name "Lill-Babs", a play on words as a connection to the older, and at that time better known, singer Alice Babs. She released her first music album in 1954, a grammophone record with two songs: "Min mammas boogie" ("My Mamma's Boogie") and "Svar till 'Ung och kär'" ("Answer to 'Young And In Love'"). Soon afterwards, finding herself pregnant, she returned to Järvsö and gave birth to a daughter Monica. In 1959, Lill-Babs performed Stikkan Anderson's song "Är du kär i mej ännu Klas-Göran?" ("Are You Still In Love With Me, Klas-Göran? "); her recording of it became a major hit. She made her theater debut in 1958 in the play Fly mig en greve ("Fly Me a Count") at Nöjeskatten theater. She also appeared in the films Svenska Floyd and En nolla för mycket ("One Zero Too Many"). Lill-Babs represented Sweden in the 1961 Eurovision Song Contest with the song "April, april". It had been performed by Siw Malmkvist in the national final, but Lill-Babs was selected to perform the song in Cannes. She participated in Melodifestivalen three times in 1960, 1961 (her own two songs did not win) and in 1973 without winning. In 1969, she participated in the Norwegian Melodi Grand Prix without winning. Soon after Eurovision, she launched a career in West Germany, where she acted in several films. She also released two English-language solo singles for the United States market. 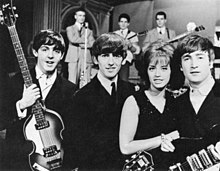 Lill-Babs met The Beatles in 1963 when she was the main guest star on the teen music show Drop-In broadcast on Sveriges Television (SVT). The then-unknown band asked for her autograph. Lill-Babs performed several shows in bars at Berns in Stockholm, Trädgår'n in Gothenburg and Kronprinsen in Malmö. Björn Ulvaeus and Benny Andersson of ABBA wrote and produced her 1971 hit song "Welcome to the World". The four future members of ABBA sang on it. Also in the 1970s she played in a Kar de Mumma revue at Folkan, and played Annie Oakley in the musical Annie Get Your Gun at Scandinavium arena in Gothenburg. Lill-Babs was the main guest on Här är ditt liv ("Here's Your Life") on 26 December 1983 when the host Lasse Holmqvist surprised her in the studio with a long line of ex-boyfriends. She was the presenter on several TV shows like Hemma hos Lill-Babs (1987) ("Home at Lill-Babs"), Morgonlust (1988) ("Morning Desire"), Vem tar vem (1990) ("Who Takes Who"), and Cocktail (1991) all on SVT. In 2010, she participated in the television show Så mycket bättre ("So Much Better"), broadcast on TV4. In 2012, Lill-Babs appeared on Stjärnorna på slottet ("Stars at the Castle"), broadcast on SVT, where she spoke about her career. In 2017 and 2018, she acted as a lesbian character Gugge in two seasons of the SVT series Bonusfamiljen; the series' script had to be changed following her death. A two-part documentary was broadcast on TV4 in 2017 called Lill-Babs, Leva livet ("Lill-Babs, Live Life"), which presented her life and career. Lill-Babs died on 3 April 2018 after suffering from cancer and heart failure. On the day of her death, both SVT and TV4 changed their programming so that programs about Lill-Babs could air. SVT broadcast the 2004 biographical documentary Lill-Babs i 50 år ("Lill-Babs for 50 Years"). TV4 changed its programming to broadcast shows about Lill-Babs including a documentary from 2017. On 6 April they broadcast Lill-Babs's episode of Så mycket bättre ("So Much Better") from 2010. On the morning when Lill-Babs's death was announced, Malou von Sivers's morning show Efter Tio ("After Ten") was about her death. Sveriges Radio also changed its programming to air shows about her. She was buried in Järvsö Church on 28 May the same year. Lill-Babs was married to the singer Lasse Berghagen 1965–1968. She was then married to Norwegian footballer Kjell Kaspersen 1969–1973. She had three daughters: Monica Svensson (born 1955), Malin Berghagen (born 1966), and Kristin Kaspersen (born 1969). She released her autobiography Hon är jag ("She Is Me") in 1996. In 2017, she was inducted into the Swedish Music Hall of Fame. ^ a b c "Lill-Babs Obituary". theguardian.com. Retrieved 9 May 2010. ^ a b "lill-babs". hant.se (in Swedish). Retrieved 3 April 2018. ^ Palm, Car Magnus (1994). ABBA – The Complete Recording Sessions. Century 22 Limited UK. ISBN 0-907938-10-8. ^ "Lill-Babs 80 år – nu hälsar hon från sin sjuksäng". Expressen (in Swedish). Retrieved 3 April 2018. ^ "Barbro "Lill-Babs" Svensson är död – P4 Stockholm" (in Swedish). Sveriges Radio. Retrieved 3 April 2018. ^ a b c d "Swedish icon Barbro "Lill-Babs" Svensson is dead at 80". Sveriges Radio. Retrieved 3 April 2018. ^ Palm, Carl Magnus (2001). Bright Lights – Dark Shadows. Omnibus Press UK. ISBN 0-7119-8389-5. ^ a b "Lill-Babs är död efter kort tids sjukdom – blev 80 år gammal" (in Swedish). Sveriges Television. 3 April 2018. Retrieved 3 April 2018. ^ "Ibland är det jobbigt att vara ensam". Expressen (in Swedish). Retrieved 3 April 2018. ^ Svensson, Barbro; Wahlgren, Anna (1996). Lill-Babs – Hon Är Jag: Minnen Av Ögonblick (in Swedish). Bra Böcker. ISBN 91-7133-184-0. ^ a b "Lill-Babs passed away". eurovisionary.com. 3 April 2018. Retrieved 3 April 2018. ^ "Lill-Babs kunne ha vore ei verdsstjerne" (in Norwegian). NRK. Retrieved 3 April 2018. ^ "Svensk succé. Lill-Babs & Co i en tidsresa till schlagerns guldålder". Dagens Nyheter (in Swedish). 11 January 2006. Retrieved 3 April 2018. ^ a b "In pictures: Sweden's most beloved star Lill-Babs dies aged 80". The Local (in Swedish). 3 April 2018. Retrieved 3 April 2018. ^ a b "Lill-Babs – svenska folkhemmets drottning". Aftonbladet (in Swedish). Retrieved 3 April 2018. ^ "Lill-Babs: Jobbigare fylla 48". Sydsvenskan (in Swedish). Retrieved 3 April 2018. ^ "Kuppen mot Lill-Babs rev upp stora känslor". Expressen (in Swedish). Retrieved 3 April 2018. ^ "Från The Beatles till Bonusfamiljen – här är "Lill-Babs" liv". Dagens Nyheter (in Swedish). 3 April 2018. Retrieved 3 April 2018. ^ "Bilden på Lill-Babs som TV4 aldrig visade". Aftonbladet (in Swedish). Retrieved 3 April 2018. ^ "Stjärnorna anländer till slottet" (in Swedish). Sveriges Television. Retrieved 3 April 2018. ^ "Lill-Babs kollega i "Bonusfamiljen": "Det var det största människohjärtat som funnits"". Dagens Nyheter (in Swedish). 3 April 2018. Retrieved 3 April 2018. ^ "Lill-babs – Leva livet" (in Swedish). tv4play.se. Retrieved 3 April 2018. ^ a b c d "Så ändrar kanalerna tablåerna efter Lill-Babs död". Aftonbladet (in Swedish). Retrieved 3 April 2018. ^ "Lill-Babs begravdes i sitt älskade Järvsö" (in Swedish). Uppsala nya tidning. 28 May 2018. Retrieved 31 August 2018. ^ "Lill-Babs – Uppslagsverk". Nationalencyklopedin (in Swedish). Retrieved 3 April 2018. ^ "1063 (Vem är det : Svensk biografisk handbok / 1993)" (in Swedish). Project Runeberg. Retrieved 3 April 2018. ^ "Lill-Babs mindre kända dotter – gått en annan väg än systrarna". Hemmets Veckotidning (in Swedish). 19 December 2017. Retrieved 3 April 2018. ^ "Fan, vad bra jag har varit". Aftonbladet (in Swedish). Retrieved 3 April 2018. ^ "Lill Babs discography". discogs. Retrieved 3 April 2018. ^ "Barbro 'Lill-Babs' Svensson" (in Swedish). Swedish Film Database. Retrieved 3 April 2018. Wikimedia Commons has media related to Lill-Babs. "Det börjar verka kärlek, banne mig"
"Det blir alltid värre framåt natten"
"E' de' det här du kallar kärlek?" "I morgon är en annan dag"
"When Spirits Are Calling My Name"
This page was last edited on 3 April 2019, at 18:44 (UTC).